If you have ever thought (seriously) about getting a TV set for your bathroom, then you’ll know all about Aquavision. The company has been working quietly for some while perfecting its range of TV sets that sit in your bathroom yet are immune to water, condensation and random squirts from awkward to use conditioner bottles. Well the company has just unveiled its range for 2010 and once again are promising that no matter how heated it gets in your bathroom the screen will never go misty. The sets are designed to be installed by a member of the Aquavision team to ensure that they can be easily mounted into walls with trailing wires etc well out of the way. On to the TVs. The new line-up comprises four models: 17″, 24″, 32 and 40″ sets that are full HD and HD ready and feature digital tuners, a component video, S-Video and analogue PC input, HDMI inputs, full scart connection and built in games. All four models are available in MirrorVision, a clever technology which means that when the television is switched off, the glass takes the form of a mirror that is suitable for shaving, make-up etc. When it is turned on, the mirror gives way to the television screen. 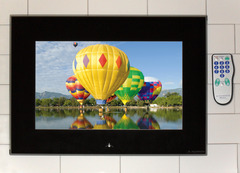 The two smaller sets have a standard glass finish and are available in Polar White, black or MirrorVision while the 32″ and 40″ are only available in MirrorVision. The sets also come with two remote controls (one master and one waterproof) and in-ceiling loudspeakers. For prices and details of installation, contact the maker.